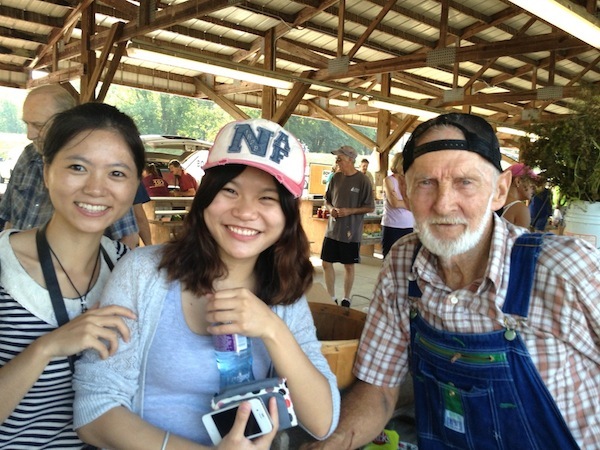 Linda and I have been wanting to support UNA's International Student Program for years. Finally signed up Monday for their "Friend's of International Student Program", met the two super sweet students we'll be hosting, Gina and Aimee (their English names), and yesterday began their tour with a McFarland Park river side picnic breakfast then straight to the Florence Farmer's Market. It was fun introducing them to some of our fav local farmers. Later we introduced them to the best Chinese restaurant in the South, the Rice Box, where our friend Chiong Chen (UNA Art Department Chair) joined us for lunch and Maggie Chen (owner of the restaurant) along with her children Wilson and Kelly stopped by for the welcome as well. Aimee and Gina seemed thrilled to have met our friends, and to have found such a wonderful restaurant just up the street from UNA.